WANT TO KNOW MORE ABOUT DIABETIC BLISTERS? 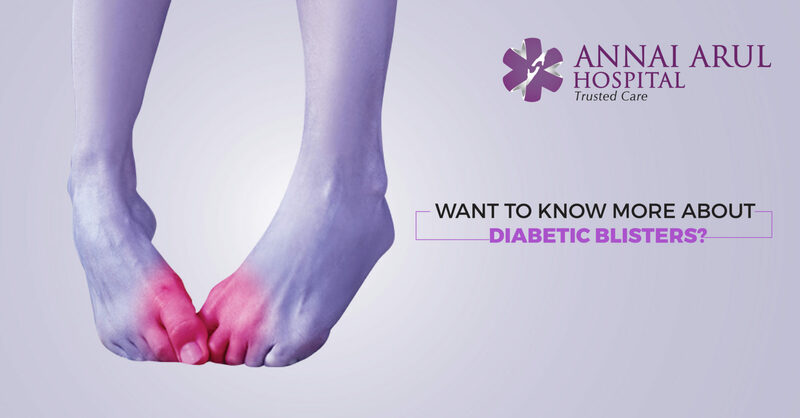 Diabetic patients usually experience the sudden eruption of blisters on their skin, these are called diabetic blisters. The blisters look alarming when first spotted but they are painless and normally heal on their own, leaving no scars. Diabetic blisters are twice more likely to be found in men than women. Diabetic blisters more often appear on the legs, feets and toes. They rarely are seen on hands, fingers and arms. Diabetic blisters can range from as large as 6 cm to micro ones. Diabetic blisters always appear in clusters, and the area around the blisters is not usually swollen or reddish. Diabetic ulcers usually last for two to five weeks and heal by themselves without any treatment or intervention. The fluid in the blister is sterile, and to prevent infection one should not puncture the blister by him/herself. Blisters can be treated with antibiotic cream or ointment and bandaged properly to protect them from further injuries. Topical creams are recommended depending on symptoms. Taking care of oneself and keeping away from sugar levels under check will help in avoiding blisters. The exact cause for diabetic blisters is not yet found. Wearing shoes that don’t fit, and fungal infection are the main causes. If the blood sugar levels are out of control then one may get diabetic blisters. People who have diabetic neuropathy, nerve damage that reduces sensitivity to pain are more prone to diabetic blisters. How to prevent diabetic blisters? It is always important to take care of your skin if you are diabetic. Blisters and lesions may not give any pain and go unnoticed if a person is neuropathic. Here are a few ways to prevent blisters and secondary infections. Inspect the feet thoroughly every day ideally before bed. Wear proper fitting shoes and socks to prevent injury. Wear gloves when using scissors or hand tools etc. Most importantly strict diabetes control the crucial step in preventing diabetic blisters.